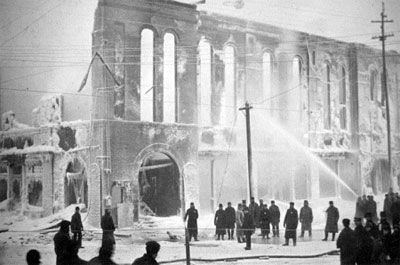 After the original Barre City Hall/Barre Opera House building, built only twelve years before, was destroyed by fire in 1898, the current building was erected on the same site. 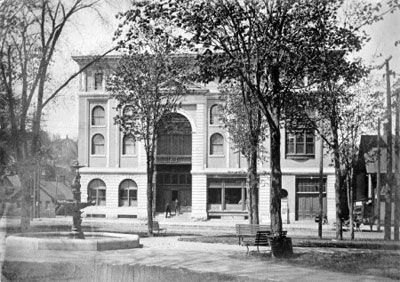 The new Opera House, considered the finest in Vermont, seated 1,000 patrons and opened on August 23, 1899. For its first 45 years, the Opera House served as performance space and community gathering site for such important events as the appearances of Helen Keller and her teacher Annie Sullivan, socialist Eugene Debs, George M. Cohan and his family, anarchist Emma Goldman, John Philip Sousa and his band, Tom Mix and his horse. 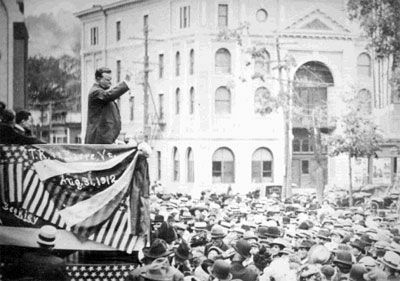 In 1912, the Opera House’s outer balcony served as a political soapbox for President William Howard Taft and as a backdrop for a Barre rally featuring former President Theodore Roosevelt. 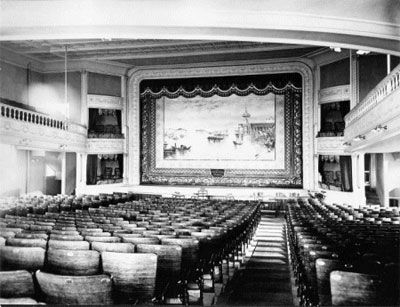 Through the 1930s and 40s the Opera House functioned primarily as a movie theater with occasional breaks in the schedule for variety shows, boxing and wrestling matches. However, with the addition of more modern movie theaters in town, the Barre Opera House doors closed in January, 1944, not to open again for almost 40 years. 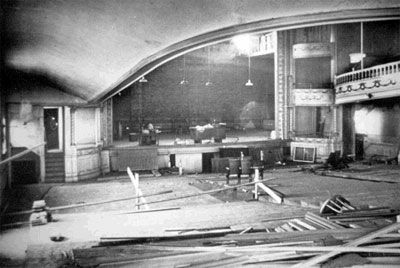 Starting in the mid-seventies, a groundswell of community interest and support culminated in the re-opening of the Opera House in October of 1982, in spite of the dingy walls, broken windows, lack of proper seats and heating. Since then, the Barre Opera House has continued its work towards complete restoration and renovation. One year it was the installation of a heating system, the next came theater chairs on the main floor. Curtains, stage lights and other amenities were gradually added as the community contributed the time, talents and financial resources necessary. Increased usage and attendance led to our most major capital construction project completed in 1993. This community-funded, million dollar project included the installation of an elevator, making the box office, lobby, stage and dressing rooms handicap accessible to. Balcony seating was also added, raising our seating capacity by about a third to 645. The work didn’t stop there. In subsequent years we have added a full service box office, a hearing assistance system and state of the art heating, ventilation and air conditioning. In the summer of 2005, we began a complete overhaul of our theatrical lighting system, beginning with the replacement of our electrical wiring, which was completed in 2006. 2008 saw the installation of a brass railing around the perimeter of the orchestra pit, and the replacement of the brass rails in the opera boxes that went missing during the theater’s period of disuse. In 2010, we sound-proofed the theater from the busy downtown street noise by adding interior storm windows. We’re currently illuminating the beautiful balcony stained glass window to make it visible from the outside of the building. On the horizon are stage rigging improvements and the replacement of orchestra section seating in rich burgundy to complete the color scheme throughout the theater. The ongoing mission to restore and operate this historic facility is only possible through the continued support of our community. To date, scores of generous individuals, organizations and businesses have contributed close to two million dollars to the rebirth of this historic treasure. 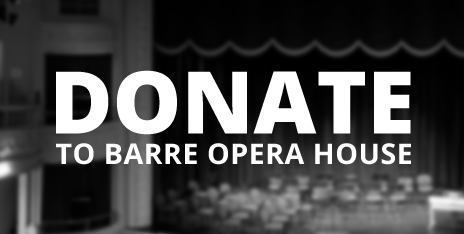 More than 23,000 people visit the Barre Opera House annually, attending performing arts rehearsals and events, public forums, corporate and private functions and community meetings. We serve a broad range of ages, and our attendees travel from all over the state and beyond to attend (and perform in) our events. We host summer theater camps and student matinees, where busloads of school children are brought in to experience live performing arts first-hand. And, as the Opera House is accessible to those with physical and hearing disabilities, we serve a large community of people with special needs. In addition to this wide variety of patrons, the Opera House provides a much needed performance space for many Vermont arts groups. The Opera House serves as a performance space for The Vermont Philharmonic, The Green Mountain Youth Symphony, Moving Light Dance, Contemporary Dance and Fitness, The Miss Vermont Pageant and many other organizations. In addition, many non-profit organizations use the Opera House for their own fundraisers, public forums and special functions, and they, along with numerous others, benefit from every improvement made to the facility.